Prime Minister Stephen Harper and His Highness the Aga Khan shaking hands on stage at Massey Hall, Toronto, February 28, 2014. Toronto, Canada, 28 February 2014 — More than a million people living in Asia and Africa will have new opportunities within reach, thanks to a five-year, CAD $100-million partnership between the Aga Khan Development Network (AKDN) and the Government of Canada, through the Department of Foreign Affairs, Trade and Development. 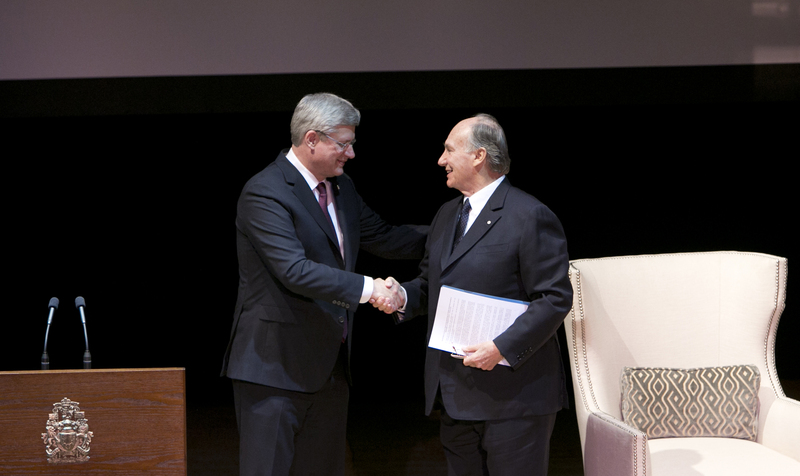 The Partnership for Advancing Human Development in Africa and Asia was announced by His Highness the Aga Khan and Prime Minister Stephen Harper at Massey Hall in Toronto. Building on three decades of collaboration between the Government of Canada and the AKDN, the partnership will strengthen health systems in Central Asia and education systems in East Africa. It will also support the work of civil society organisations working on gender issues, climate change adaptation, and innovative approaches to alleviating poverty. In Canada, Aga Khan Foundation Canada (AKFC) will launch public engagement and learning activities, giving Canadians the chance to participate more meaningfully in improving quality of life for people in the developing world. The partnership will enable Canada to leverage the extensive institutional and intellectual assets of the AKDN. In addition, AKFC will contribute up to CAD $25 million, sourced entirely from Canadians participating in the World Partnership Walk and World Partnership Golf events, which raise millions of dollars annually to support international development programs overseas. The Government of Canada will contribute CAD $75 million. The announcement of this initiative follows Thursday’s historic signing of a Protocol of Understanding by His Highness the Aga Khan and Prime Minister Stephen Harper, committing Canada and the Ismaili Imamat to regular, high-level consultations on a range of global and regional issues.